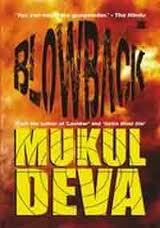 “Blowback” begins where “Salim Must Die” ends with Iqbal (The terrorist turned Force 22 officer) and Tanaz having to stay back in Pakistan. After spending a few days in a terrorist hideout they manage to reach India only to find out that a group called Indian Mujahideen (IM) behind terror strikes in Surat, Jaipur and Varanasi . The rest of the book deals with how he is sent undercover to destroy the group and save millions of lives. Mukul loves to play with truth and when you mix truth with fiction it surely is a deadly cocktail. Whether talking about IM or referring to their terror strikes or the way in which they took place (bombs on cycles), Mukul surely makes you shudder as he brings those memories (2006-2009 when IM attacked especially during the Project Karachi days) right in front of ones face. For every Indian, especially for the ones who lost their loved ones, those attacks invoke fear and anger in equal measure. The author even goes on to talk about YPS (Youth for Purity in Society) which is an alias for SIMI (Students Islamic Movement of India) who was regarded as influencing the terrorists. Then there is also the Bardhan House Encounter which is an actually enactment of the Batla House Encounter. Like each one of his books, this one too moves at breakneck pace keeping one captivated throughout. But this particular book takes his writing to an altogether dizzying height. While the earlier parts had a few instances here and there which were the truth to an extent, this one thrives on reality in each and every part. And that is bound to find him more fans than before. His portrayal of reality with doses of fiction actually take you back to those years thinking how unsafe each of us were and are even today in our own country. If one comes to think of it, the book was released a few months before the German Bakery blast in Pune. And interestingly the undercover agent alongwith the terrorists are put up in Pune. Nostradamus anyone? Among the characters, he deserves an applause for the way he has portrayed Iqbal’s trials, tribulations, anger at the terrorists and the pride with which he bears his patriotism on his sleeve. Waiting to see how the 4th part pans out. From what I feel, it should be a cracker of a finale!! Learning to live in the terror democracy of the world!! is there any particular way you want me to promote ur initiative?